You are here: Home / Knitting Solutions / Answers to Your Knitting Struggles / Is Startitis Driving You Crazy? Read This! After “finding the time to knit,” I discovered that many knitters have what some called a “too many WIPs [works in progress]” issue. Others called it a “Startitis” issue. I was surprised at the intense frustration I felt emenating from these responses. I usually find my multiplying WIPs a source of amusement, but for these lovely knitters, the large numbers of WIPs was a source of annoyance. Even anger… at themselves! So the first thing I want to say to any knitter who feels angry with him or herself at your large number of works in progress: please give yourselves a break! If so, fantastic! I’ll say it again: give yourself a break! In fact, I can think of many benefits of having several knitting projects in the works. If you become overwhelmed or frustrated with one project, you can easily switch to another without having to find needles or yarn to cast on a new project. When you feel like you’ll cry if you have to knit one more stitch of black or green or brown (or any other color you’re getting really tired of), you can switch to another project. Maybe one that’s multi-colored or hot pink or has stripes. Bored silly knitting endless rounds of stockinette for a pair of socks or a sweater? Switch to that cabled project or that complicated intarsia and re-engage your brain. In short, when you have a whole lot of projects on the needles, you always have a way to easily switch gears whenever something in your current project isn’t bringing you joy. After all, why else do we knit? If it’s not first and foremost to bring ourselves joy, then I don’t really see the point! But what if your problem is more that you can’t seem to avoid casting on for a new project whenever you see a new, shiny pattern? Or maybe a brand-new yarn that is just begging for you to dig into it? But if your Startitis consists of “I just saw this pattern, and I must cast on NOW” or “I bought this yarn on sale, I couldn’t help it, it was a tremendous bargain and it’s gorgeous and I can’t stop petting it”? Assuming you’re using stash yarn or that bargain yarn you couldn’t resist, it costs you little to nothing to indulge. 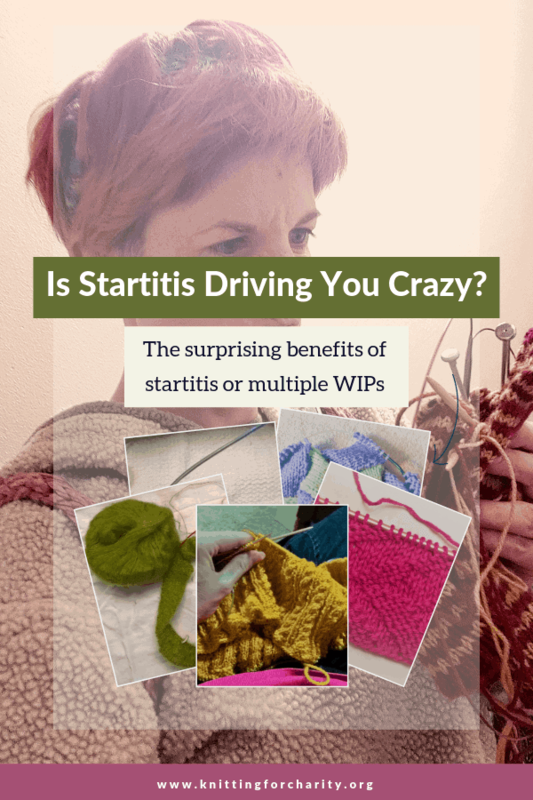 Startitis often evolves into “too many WIPs,” which has all the above benefits. Especially if you enjoy a wide variety of projects, multiple WIPs and Startitis can be a tremendous boost to your knitting bliss. I’m anticipating two responses thus far. So what can you do if you really want to turn your Startitis into Finishitis? Head over to part 2. Here I discuss some strategies to manage Startitis and turn those WIPs into FOs. In the meantime, share below. What drives you crazy about Startitis and multiple WIPs? Do you find any benefits at all to having multiple WIPs? I like having multiple knitting and crocheting WIPs because sometimes I just HAVE to knit (or crochet), but I’m bored with what I’m working on and if I have more than one project then I can switch. The problem is that I have too many of a good thing. I have something like 3 or 4 complete sets of knitting needles and crochet hooks (mostly bought separately because I’m already using the ones I already had) and most times I want to start a new project I cant find a vacant pair of needles or hooks….I can think of six crochet WIP that I started within the last year and probably four knitting projects started in about the same time period. That wouldn’t be so bad, except that I also have 2 80-gallon bins crammed FULL of WIPs that go back to college (approximately 13 years). I will never finish those because I’ve lost the pattern, or run out of yarn, or some other similar problem. I should frog them and make something new out of the yarn but I don’t since I manage to convince myself that someday I’ll find the pattern, or figure out how to switch to a different yarn, or how to turn it into something different. I also have something like two dozen projects that are completed, except that I’ve never wove in the ends, or sewn on buttons, or other minor details like that. Its interesting to note that of all these older WIPs, they are made of cheap acrylic yarn (Red Heart, Lion Brand, etc). Nearly all the ones that are almost done are either of nicer yarns (like bamboo or alpaca). I also have a considerable stash of that nicer wool, alpaca, cotton, silk, bamboo, and linen yarns some of which were acquired as many as 4 years ago. I keep asking for more for birthday, mothers day, and christmas and not using them because I want to find the “perfect” pattern. I also have a sizable stash of handspun yarn that I’ve never done anything with and wool and bamboo and other fibers ready to be spun that I’ve never done anything with. My single biggest problem with this…the organization! I have the two bins of old WIPs, a bin of my nicer yarns, and a bin with my handspun and my raw fibers, but the rest of it covers my desk with barely enough room for my keyboard and mouse pad, covers the bottom of my closet, various WIPs stashed on bookselves (and really any other flat topped furniture around the house), the extra coffee table in my bedroom, a couple of tote bags in my car, and three boxes and four tote bags that have WIPs and stash yarn scattered around the house. Yeah…I’m pretty sure I have a problem and I hope next week’s article will help! Danielle, next week’s article should help you get organized. And a soon-to-come article series will also address another problem you may have (not judging, understand): the overgrown stash! I do also think it might be time for you to be honest about those super-old WIPs. When you consider addressing them, do you feel excitement or dread? I have a feeling it might be the latter, in which case I do think you might find yourself feeling much better if you frog them and reclaim the yarn (as well as the needles). Just a thought! I agree with Tamara – I like having 3-4 projects going so I don’t get bored with just one. If I have one that I’m avoiding, I will work on that one for 10 minutes before allowing myself to go on to one I really want to work on – sort of a reward system for myself. I find I move along more quickly on all projects if I use this method. I typically have one “long project”, a sweater for example, and then 2-3 short projects (hats, gloves etc). The long project is the one I tend to avoid until I start seeing progress, such as the back completed. I am happy to see how other people feel about Startitis!! I was starting to wonder if I didn’t have a horrible personality disorder!!!! Soldier on, knitters!! I have so many WIPs that I now have them in two fabric totes(decorative, since they sit in my living room). So I find myself buying more needles and project bags to start something else. I already have a S.A.B.L.E. (Stash Acquired Beyond Life Expectancy). Some WIPs are put aside cuz I no longer enjoy working on them, some I’m stuck and don’t know how to continue. I think it’s time for me to look seriously at each one and decide: tink or save. 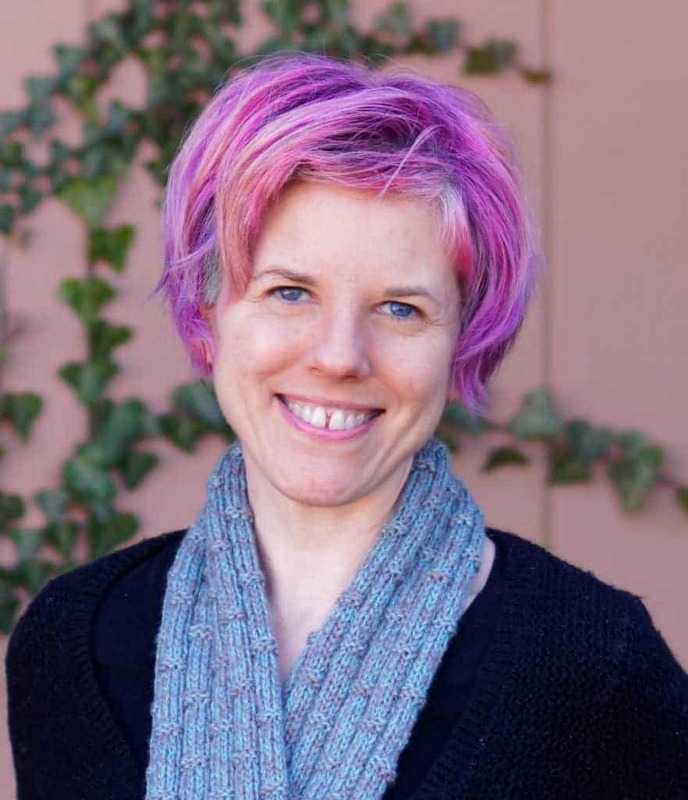 Thanks, Nicole, for providing great topics, patterns, charity sources. You’re welcome, Carol! You’ll definitely want to tune in next week. I’ll be offering a free resource to help you do exactly what you’re talking about here! I am a started and not a finisher unless it’s a prayer shawl for someone. What I’ve learned is if I leave a project, it would be a good idea to write myself a note with important info, such as what size needles if they aren’t already attached, a copy of the pattern, where I left off and where to start etc. My WIPs currently have none of that info and sooner or later I will be frogging and beginning again. On the flip size it’s such a great feeling to wrap all that lovely yarn into a ball to begin again. Thanks Nicole for all the fun info on your emails. I don’t mind my WIPs, I say that I have Craft ADD and it’s great having something different to pick up when I get bored. Now, my hubby, he’s the one with the problem. He’s always nagging me about finishing things so we can give them to the people I originally intended them for, he has a problem leaving things half done and can’t understand why I don’t. It’s a joke in my family that I finished my first daughter’s baby blanked in time for her 16th birthday! Nicole, I have a malady that is the opposite of startitis, maybe it could be called stuckitits. I need a new project, possibly to make for the two upcoming birthdays for 4-yr olds or to use up some stash or to finally dive into a lace project. I spent most of yesterday on the computer, just looking for patterns to fit the girls or to fit my available yarn. Any suggestions for getting unstuck? I think the answer is just “pick one” but I am seriously stuck in limbo. Oh Beth, now I truly feel you here! I’m constantly getting into “Stuckitis” where I have about 3 or 4 different things I’d like to try next but I can’t figure out exactly what. “Just pick one” is probably the best advice I have, but with a twist: Pick one and see how it feels. You might realize after you cast on, or a few rows in, that you’re not really feeling it. Then give yourself permission to either set it aside or just frog it (especially if you want to reuse the yarn and/or needles). I think if you try this, eventually you’ll find a pattern that you’re excited about. Good luck! This is exactly me. I am so afraid of having startitis that I am stuck. I have a five year old and a three year old. I think * maybe* because we have littles and our time is scarce that we put more pressure on ourselves to get it right the first time. Idk just my analysis after not knitting much since kids. We are having our third in October, God willing and I really want to get a project going!! Hope you are able to narrow down the projects and then happy knitting! ???? Congratulations on baby #3, and I hope you can find that perfect next project! I don’t mind having multiple projects on the go because I like to have the variety of switching between them. I do find if I leave a project for too long though I tend not to go back to it. Those projects really needs to be frogged and the yarn needs to go back into stash. I could get better at doing that. But I don’t really beat myself up about it. My crochet is about the only area in my life where I’m allowed to have multiple projects on the go and not finish them!! Looking forward to part 2 Nicole!